By targeting mitochondria with the anticancer drug cisplatin, chemists have developed a new way to kill cancer cells that have shown resistance to cisplatin. Cisplatin is a chemotherapy drug given to more than half of all cancer patients. The drug kills cells very effectively by damaging nuclear DNA, but if tumors become resistant to cisplatin they often grow back. A new study from MIT and the University of Toronto offers a possible way to overcome that resistance. The researchers found that when cisplatin was delivered to cellular structures called mitochondria. DNA in this organelle was damaged, leading to cancer cell death. Moreover, the mitochondrial-targeted drug could overcome cisplatin resistance. “These results suggest that the mitochondria can be an important target for platinum-based drugs,” says Robert Radford, an MIT postdoc and an author of a paper describing the findings in the October 31 online edition of the journal Biology & Chemistry. Mitochondria-targeting cisplatin might also be effective at lower doses than regular cisplatin, helping to avoid some of the severe side effects often seen with the drug, according to the researchers. Senior authors of the new paper are Stephen Lippard, the Arthur Amos Noyes Professor of Chemistry at MIT, and Shana Kelley, a professor of biochemistry and pharmaceutical sciences at the University of Toronto. Lead authors are Simon Wisnovsky, who received his PhD from the University of Toronto, and MIT alumnus Justin Wilson PhD ’13. 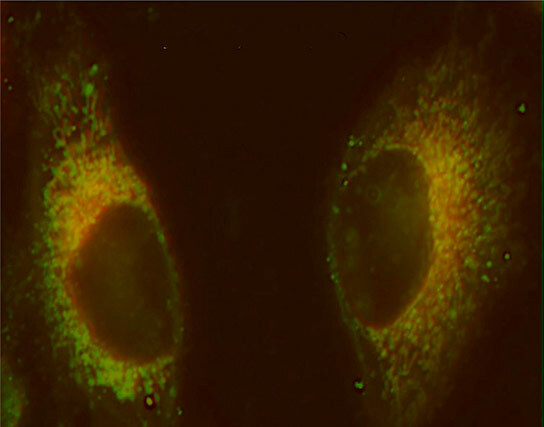 “This is the first study to isolate the effects of a platinum drug in mitochondria, and we were very intrigued to observe that the DNA damage caused by this drug outside of the nucleus were highly toxic,” Kelley says. Cisplatin, which contains the metal platinum, was approved to treat ovarian and testicular tumors in 1978 and is now used for many other cancers, including lung and bladder. The drug forms crosslinks in DNA, creating blockages that interfere with a cell’s ability to read or replicate its genome. If enough of these blockages form, the cell undergoes a type of programmed cell suicide called apoptosis. However, questions remain about cisplatin’s effects in other parts of the cell, Radford says. To help figure that out, the researchers created a form of cisplatin targeted to go to mitochondria — cell organelles that generate energy. These structures have their own DNA, inherited only from the mother, which is essential for mitochondrial function. Because mitochondria are involved in apoptosis, the researchers wanted to see whether they could induce cell death by targeting mitochondrial DNA, particularly in cells that are already resistant to regular cisplatin. To do that, they developed a new way to tag the drug with a protein fragment developed in Kelley’s lab that can enter the cell and accumulate in mitochondria. The mitochondrial-targeted version of the drug killed cancer cells and cisplatin-resistant cells with the same success rate. With regular cisplatin, killing resistant cells requires about 10 times the amount of drug needed to kill the same number of nonresistant cells. However, by targeting the platinum-based drug to mitochondria, at a given dose, the researchers showed they could kill equal numbers of resistant and nonresistant cells. The drug was even more effective in cells with an impaired ability to repair mitochondrial DNA. This result was one of several pieces of evidence the researchers obtained proving that the new mitochondria-targeted, platinum-based compound was working by targeting mitochondrial DNA. The researchers also showed that the cells were dying through apoptosis, and not some less-controlled form of cell death. “There are other ways for a cell to die besides apoptosis. You want a therapeutic agent to induce programmed cell death because it is a more efficient process. With forms of nonprogrammed cell death, cellular toxins can spread, leading to inflammation and other deleterious consequences.” Radford says. The researchers now hope to explore mitochondrial-targeted cisplatin’s potential use as a chemotherapy drug by testing it in animals. They also plan to try targeting cisplatin and other metal-based drugs to different parts of cells, which could lead to development of drugs that are more effective and have fewer side effects. Cisplatin and a handful of other platinum drugs are the only metal-based drugs now approved for human use, but researchers around the world are working on other types of metal-based drugs. The research was funded by the National Cancer Institute, the Canadian Institute of Health, and a David H. Koch Graduate Fellowship. Be the first to comment on "Scientists Develop a New Way to Kill Cancer Cells"